The Pier (Jetty); half way between the Pier and the Customs House; the Customs House; near Sea-View House; Adams unoccupied ground; School Corner; Widow Watts’ house; Regent St; Prew’s Terrace; the Vicarage; the further end of Catherine Terrace; near the “Chapel”; Miss Hobbs’ Corner; corner of Victoria St; at main Highbridge Rd by Mr John Tutton; by Farmer Norriss’s premises; opposite the Crown Inn; Cross Hill; Thorne’s, opposite Mr Reed’s gate; Mr Gunter’s garden gate; Church gate; Chadwick’s stables; near Woodman’s house; opposite Avent’s; corner of Regent St; halfway up Regent St; opposite Brunswick Cottage; near Lott’s in Alfred St [High St]; Winter’s Corner; Halfway between Winters and the station; near station gate; in the station; under Allen’s wall, Berrow Rd; near Poorhouse opposite gasworks; John’s stables, Berrow Rd. A suggestion was made that a light should be put in Love Lane but Mr Reed stated that the gas pipes did not extend that far at present. 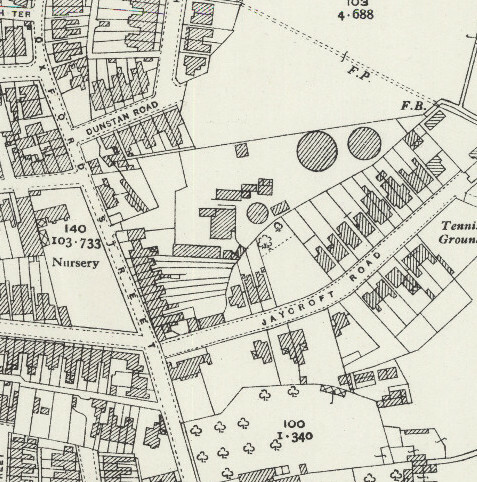 The map below (os 1844-88) shows the site and extent of the gasworks at around this time. 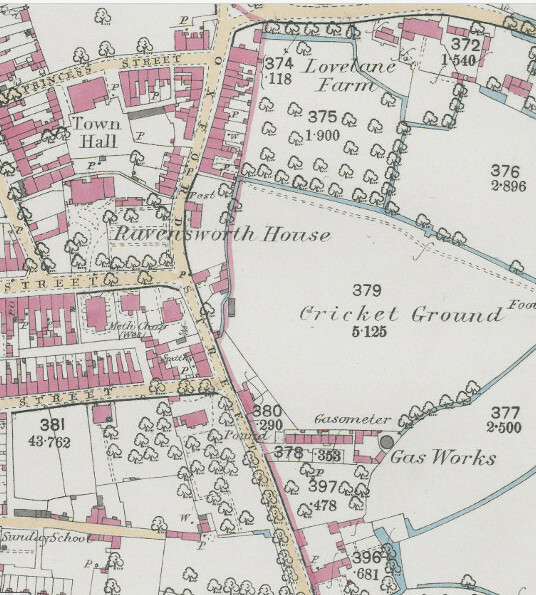 The town plan of 1852 shows the same footprint. Only one small gas container can be seen. The south-eastern boundary of the works corresponds to what is now the south-eastern boundary of Lidl’s car park. The next map is from o.s. data of 1899-1903. It can be seen that the works have been extended and another larger gasometer has been added. The 1921-43 o.s. data (below) shows much enlargement. 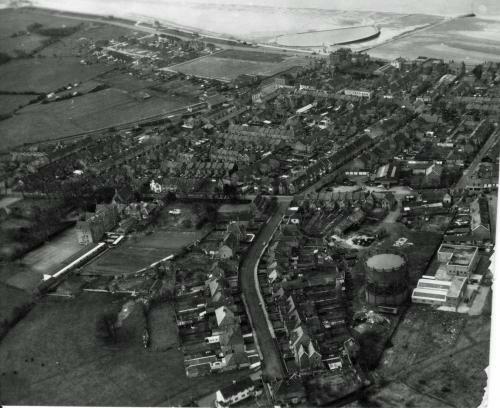 The original gasometer is now gone and two much larger ones have been built on the site now occupied by Kingdom Hall and the land behind it. 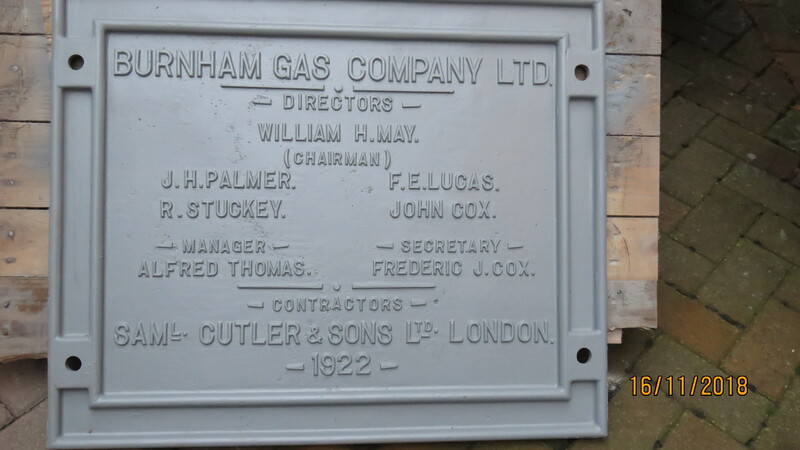 Above is the 1920’s sign from one of the gas holders, which was donated by the family of Mr Lynham, the last manager of the site, who had rescued it during demolition. It is being refurbished with the hope that it can once more be displayed on the site. 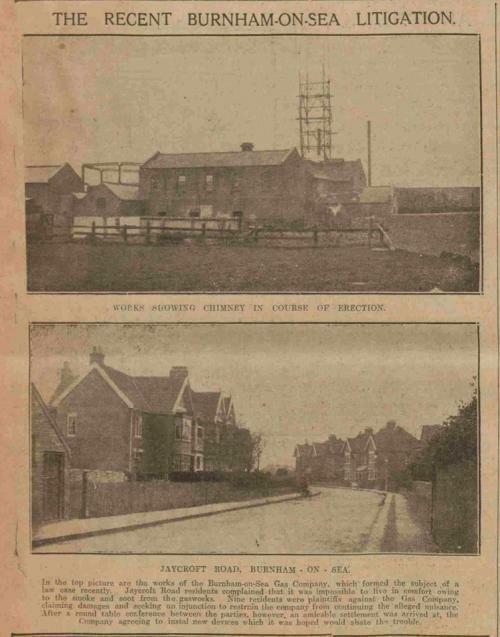 In 1922 there was a threat of litigation against the Gas Company by residents of Jaycroft Rd. The report below appeared in the Western Daily Press in June of that year. 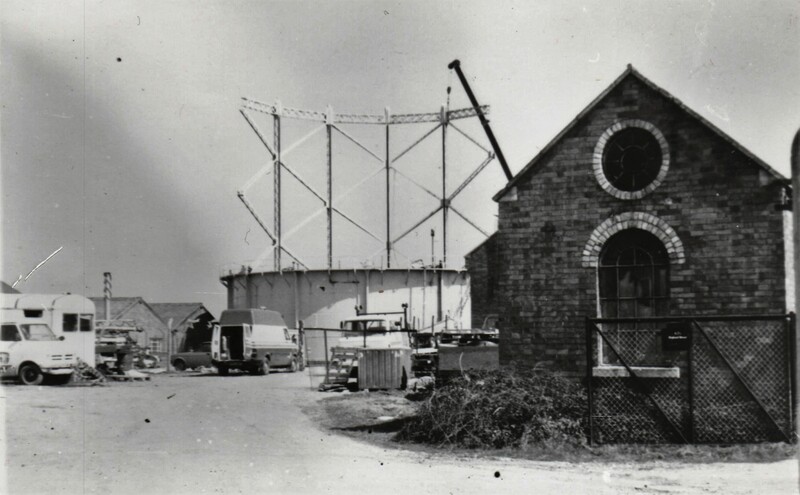 Many residents will remember the gasworks and also many visitors will remember seeing the gasometers in the distance on their approach to Burnham down Love Lane. 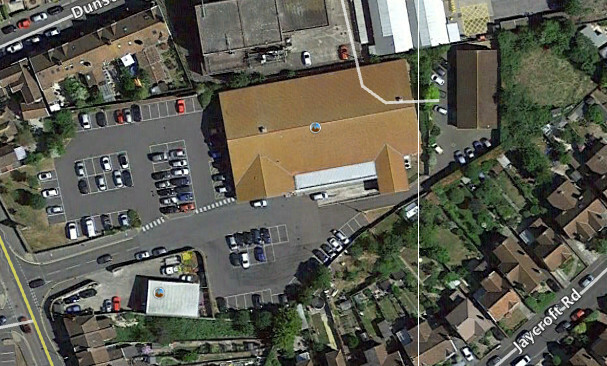 Above are aerial views of the extended site and as it is now, occupied by Lidl. The outline of the last remaining gasometer can still be seen on the land behind Kingdom Hall. The gas works was finally demolished in the mid 1980’s. 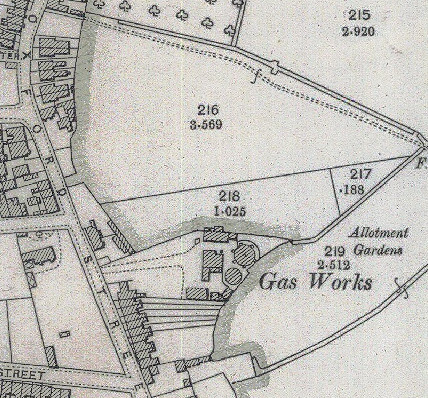 Any recollections or pictures of the gasworks would be welcome.